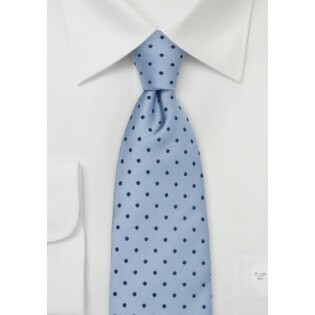 Chevalier designed this soft blue necktie from 100% silk. The dark blue polka dots are woven into the fabric, and give it a thicker feel with perfect drape. This tie is wearable in most office dress environments. 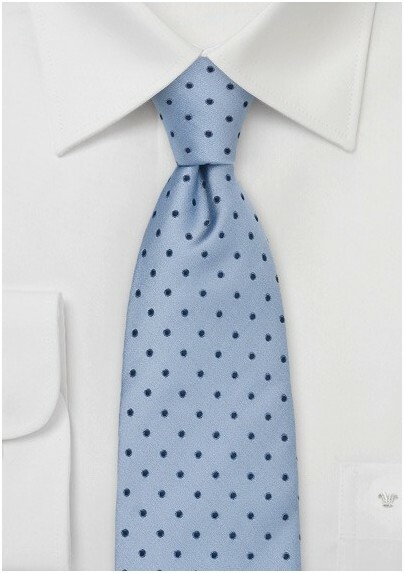 The light blue color makes this tie a cheerful accent at casual events. This tie is easy to match with most neutral colored suits, and solid colored, and patterned shirts. When you pair this tie with a white dress shirt and dark gray suit, you will make a subtle and authoritative statement.